Prescribed bushland burning significantly reduces the amount of ground vegetation (fuel) that acts as a fire hazard during our summer months. Prescribed burning also helps maintain our natural bushland’s biodiversity. Use the form below to request a hazard reduction burn by the Bush Fire Brigades. For any queries contact the Chief Bush Fire Control Officer on 0428101132. Due to unsuitable weather conditions prescribed burning program has now ceased and will continue again during spring 2019 (first rainfall). 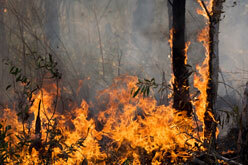 Smoke from bush fires can exacerbate asthma and other respiratory conditions and can cause a cough, shortness of breath and irritate the eyes, nose and throat. If you have a respiratory condition such as asthma, ensure you have your regular medications at hand.